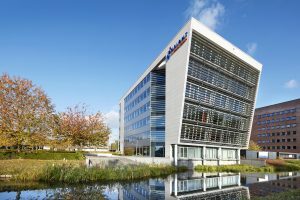 QSight IT leases extra office space in Arnhem | Nexus Real Estate B.V.
January 2018 – Nexus Real Estate has leased approx. 620 m² of office space for a period of 10 years to QSight IT in the Entre Vallée building at the Mr. B.M. Teldersstraat in Arnhem. Qi ICT from Delft and Onsight Solutions from Arnhem have joined forces in the beginning of September last year. Through a merger of both organizations, under the name QSight IT, the largest Dutch player in the field of (cyber) security, networking, cloud and risk management emerged. In October 2017, QSight was taken over by KPN. The building was acquired in 2015 by a client of Nexus Real Estate as part of a larger real estate portfolio. Due to the departure of law firm CMS, the building was at risk of becoming almost completely vacant in June 2017. However, per June 2017, Nexus successfully leased the building to QSight for a period of 10 years, after which it was sold in July 2017 to a private investor in Arnhem. With this lease expansion, the building is fully let to QSight IT and Alfa-Beta Solutions. Nexus Real Estate has realized this transaction on behalf of the new owner of the building.